Milkweed Farm | A coastal Maine farm that employs sustainable organic and biodynamic farming practices. We are a diverse, family-run farm on 12 acres in Brunswick, Maine. Our motivation to farm came from a desire to feed our children the most wholesome food we could provide. We aspire to utilize sustainable farming practices including rotational grazing, cover cropping, companion planting, and biodynamic farming practices, to grow delicious and nutritious food for family, friends and the local community. See our 2018 Milkweed Farm Application Form to sign up for a share! 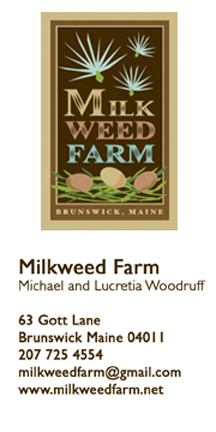 Milkweed Farm · A coastal Maine farm that employs sustainable organic and biodynamic farming practices.